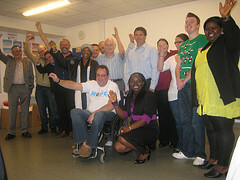 iv) To channel talent into strategic projects which practically help to put back into wider British society. The City Circle runs a range of outreach programmes, such as feeding the homeless in central London, Saturday schools and regular talks at their new base off the Edgware Road. Currently it is showing a series of films looking at related issues of immigration, integration, race and identity in Britain, “InteGREAT BRITAIN,hence All White in Barking. Though now a decade old, the film still has relevance (by no means only to the borough of Barking & Dagenham) in its exploration of people’s often irrational fears and prejudices regarding other races and religions. 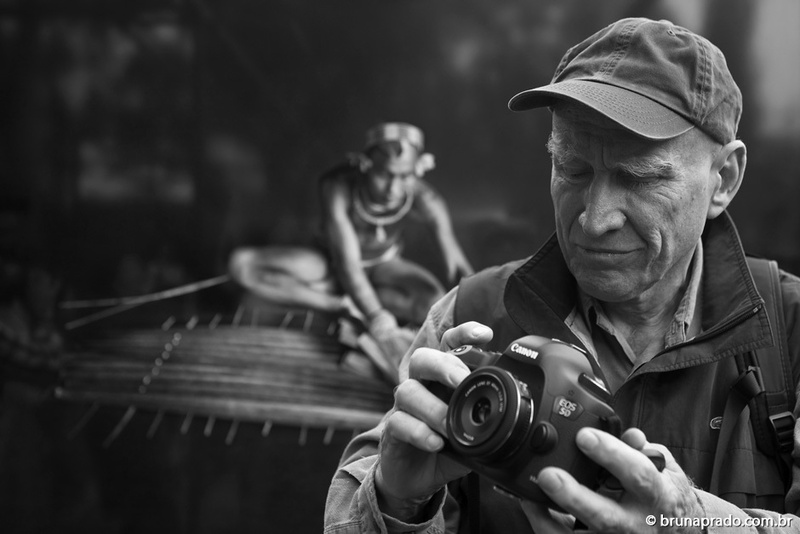 Most of it is fly-on-the-wall style reportage, following a small number of central characters, such as the late middle-aged white couple who suddenly find Albanian and African neighbours living on either side and have to be coaxed into having anything to do with them, or the elderly Jewish Holocaust survivor living with his much younger Nigerian “carer”. The dialogue is at times shocking, at others hilarious. At least one of the people featured never faces up to the new multicultural reality and moves to Canvey Island. When the film was made, there were 12 BNP councillors in Barking & Dagenham. All of them subsequently lost their seats, though I was saddened to see that there is a BNP candidate standing in Dagenham & Rainham constituency in next month’s general election. The BNP wins were a wake-up call not only to the Labour Party that has dominated the area for decades but also to local community organisations, and I believe the situation has improved a lot since then. Barking & Dagenham is, if anything, even more diverse than it was a decade ago, but there does seem to be more interaction between communities, not least among the young. But that does not mean everything is hunky-dory. The central message of All White in Barking is as relevant today as it was back in 2007: confront your inner fears and prejudices, engage with those who are different and open your minds. Nick Griffin, Leader of the British National Party and MEP for the North West of England, was declared bankrupt at his home town of Welshpool this week, but he announced that he will still be standing for re-election at the European elections on 22 May. He is legally entitled to do so, as bankruptcy is no longer a barrier to candidature and he will be entitled to a better redundancy package when he loses his seat in the polls, which I hope and believe he will. The BNP is a stain on multicultural Britain, but fortunately like most far-right groups it has been a hotbed of factionalism and personal rivalries. 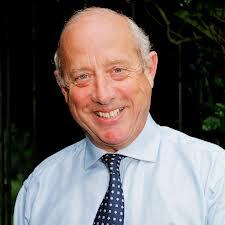 The other BNP elected as an MEP in 2009, for Yorkshire and the Humber, Andrew Brons — previously Chairman of the National Front — withdrew from the BNP and now sits under the label British Democratic Party. I suspect he will lose his seat as well, if he stands again. That is not just wishful thinking. Though far right fringe parties come and go in Britain, they are always a flash in the pan. The BNP had 12 councillors in the London borough of Barking & Dagenham, as well as a few in neighbouring Havering and Redbridge, for example, but subsequently lost the lot. It’s been a similar picture in the rest of the country, so that at the moment there are just three BNP councillors left in the whole of the UK. Given the way the party has imploded, how soon will be able to say farewell to them as well? The strong showing by the United Kingdom Independence Party in this week’s county council elections and recent parliamentary by-elections has been causing shudders in Britain’s other political parties and strengthens the hand of right-wing Conservative MPs who have been urging David Cameron to drift towards the UKIP agenda in an effort to stop the haemorrhage of traditional Tory voters. 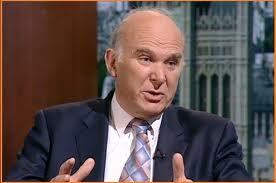 I trust we will not hear any such nonsense from Liberal Democrat parliamentarians. Even though sizable numbers of traditional LibDem voters also probably opted for UKIP this time I believe that was mainly as a form of protest. All three main political parties are suffering from voter disaffection and in particular the LibDems, as unfortunately many people in the UK don’t understand Coalition politics and the fact that as a junior partner in government the Liberal Democrats have only a certain degree of clout. But the really important thing, I believe, is that the Liberal Democrats must be bold enough to confront UKIP’s two main policy planks — anti-immigration and anti-EU — and tackle them head-on. I deliberately put immigration first, despite the fact that withdrawal from the EU is UKIP’s most well-known USP, as I believe the scare-mongering by UKIP regarding immigrants was more effective in garnering votes for the party than Nigel Farage’s attempts to ridicule Brussels. Opinion polls consistently show that for the vast majority of British voters Europe is way down their list of political priorities. But Farage and his colleagues have been steering the anti-immigrant bandwagon in a way that used to be more the role of the BNP and National Front. Farage’s repeated warning about the UK “opening its doors” to 29 million Bulgarians and Romanians from 1 January not only ignore such realities as the fact that the more favoured destinations of Romanians who do want to emigrate are Italy and France, and for many Bulgarians Germany is seen as more desirable because of low housing costs and a growing economy but also propagate the distinctly racist implication that all Romanians — and particularly Roma — are criminals. The LibDems — who currently have a working group looking at immigration and related issues — need to stress how much the British economy has benefited from immigration (which of course has to be controlled but not in an arbitrary fashion). Moreover, with regard to the EU the Liberal Democrats need to be brave enough to stand up and proclaim why leaving the EU would be disastrous for Britain. Certainly some reforms of the EU are needed, but you do not reform an organisation by leaving it. The European debate has been hijacked by UKIP and it is urgent that the alternative case is put strongly — by the LibDems. 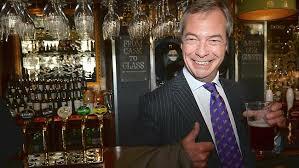 Ken Clarke — the thinking man’s Conservative — has aptly described UKIP as a rallying point for waifs and strays. Though some of its members — and presumably its MEPs — are genuinely motivated by a belief that the European Union is the worst thing since the Third Reich a great many of its supporters are essentially people who look at a ballot paper marked Conservative, Labour, Liberal Democrat and respond “None of the Above”. One reason for that is that none of the three major British political parties manifests xenophobia as overtly as does UKIP. It’s no use party leader Nigel Farage pleading that UKIP is not racist: the party’s anti-immigrant rhetoric, including the latest demonisation of Bulgarians and Romanians, is distinctly racist in tone. Some of the motley crew who have been signed up to stand for UKIP in this Thursday’s County Council elections have expressed openly homophobic opinions as well; one described gays as “termites”. Farage himself has admitted that the party has not had time to vet these newbie candidates thoroughly and that there might indeed be some members of the BNP and convicted criminals among them. It is significant that the hateful English Defence League (EDL) urged that other far-right parties, including the BNP, should not stand against UKIP candidates so as not to split the vote. As Geoffrey Bloom, one of UKIP’s more colourful MEPs, has warned, the party has not had time to draw up a clear manifesto of policy either. Mr Bloom, you may recall, is the gentleman who argued that women should spend more time cleaning behind the fridge. Feminism is almost as sinful as homosexuality in the lexicon of many “Kippers”. It is a fact that several of UKIP’s MEPs later walked out of the party after they got elected, and I won’t go into the criminal activity that landed certain people in jail. But Farage is a good comedy turn and is getting blanket coverage in the media so is an attractive nanny for the “waifs and strays”. For me the most alarming thing, however, is the way that the right-wing of the Conservative Party is cosying up to UKIP because it is afraid the party is taking away Tory votes. It’s a very dangerous strategy, but maybe not all that surprising when you consider that the Tories are in a group in the European Parliament that contains some pretty intolerant and offensive right-wing parties. UKIP’s intervention could lead to some very interesting results on Thursday, with the Conservatives likely to be the biggest casualties. The number of UKIP councillors elected might be small, thanks to Britain’s quirky electoral system, but the party’s bubble needs to be burst — and its shortcomings highlighted — before next year’s European elections, when a sizeable UKIP vote under a proportional system could make them the biggest contingent, doing incalculable damage to the UK’s reputation amongst our continental partners. The good news in the London borough of Barking and Dagenham in May was that the BNP got wiped out. They lost every single councillor they had and party leader, Nick Griffin MEP, failed miserably in his attempt to seize the parliamentary seat of Barking from Margaret Hodge. But the bad news was that the borough became a one-party state, sharing with neighbouring Newham the ignominy of having a 100% Labour Council. That’s right, not a single opposition member. That can’t be good for democracy and it certainly isn’t good for the people of Barking & Dagenham. So it was with great pleasure that several members of the London Liberal Democrats’ regional executive joined local LibDem campaigners to launch a rejuvenated local party in the borough this evening. It’s not all that long ago that Eastbury ward in Barking was LibDem held, but unfortunately one of the councillors died and two moved away. However, the fightback starts here. 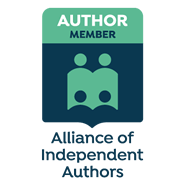 And there will be plenty for local members and new recruits to do before the next round of local elections in 2014, given the likely AV referendum in May next year and the London Mayoral and London Assembly elections in 2012. 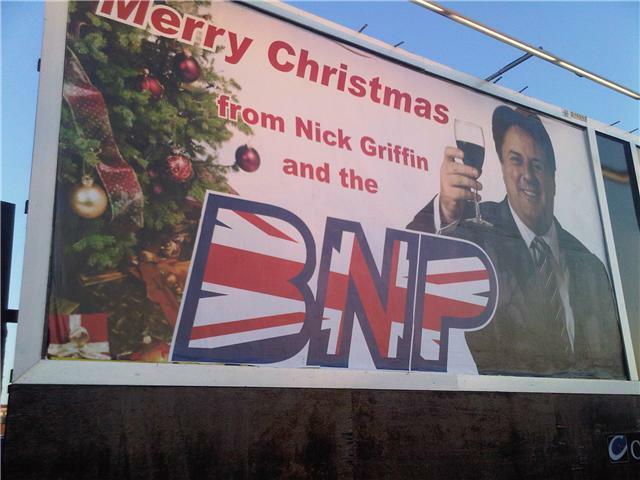 Jolly seasonal posters have started appearing on hoardings around Barking in East London, showing British National Party leader Nick Griffin toasting everyone with a glass of wine and wishing them a Merry Christmas from himself and the BNP. If anyone had any doubts that the party was going to fight the parliamentary seat seriously at the forthcoming general election, such doubts must now be dispelled. The BNP has already caused outrage by associating itself with Winston Churchill (a politician who fought against fascism all his life) and the Battle of Britain. Now the wretched racist crew is trying to co-opt Christmas — the celebration of the birth of a prophet who preached love and tolerance, the very opposite of many BNP messages. It’s enough to make one puke. 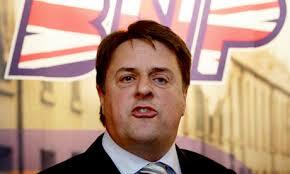 Doubtless this latest BNP manoeuvre will be condemned by Church leaders; it certainly should be. And it should galvanize other political parties to redouble their efforts to show the Barking electorate that Nick Griffin and his mates in no way represent the Best of British.